Asset Pipeline has become popular thanks to Ruby on Rails which implements it nicely out of the box. In this post I will explain what an asset pipeline is, how you can easily implement it without using Ruby on Rails and why you should consider using it in your webapp. Asset Pipeline is the name given to the way we serve static files to web applications. An asset pipeline can do many things to our files before they are served. Below are the most important and most used actions we can perform on static files. There are many ways to implement the tasks above. You could perform these tasks manually whenever you change any file (which is not a good idea) or you can use task runners to automate them, such as Grunt or Gulp. As I mentioned above, Gulp is a task runner and it can automate many things for you. 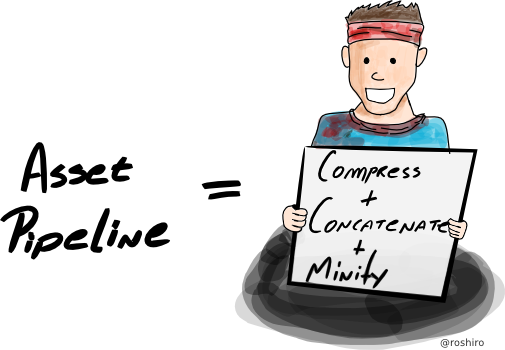 In this post I'm going to use it to automate the necessary tasks to build an asset pipeline. Now let's take a look at gulpfile.js. This is the most important file in Gulp, where everything is defined. We start off by declaring all the plugins we're going to use in our tasks. There are plenty of plugins available for almost any task you need. Next we'll declare the paths where our scripts, stylesheets and images reside. Now let's create our first task in Gulp. The second task will be called images. And it will optimise the images and place them into dist/images folder. And the third task will be called styles which will grab all the stylesheets, compile the SASS files we may have, concatenate them into main.css and then place it into dist/styles folder. Those are the three main tasks we need in order to have an asset pipeline. And after defining the tasks, how do we run them? To run any task we we go to the terminal and type gulp <task_name>. Is there a way to run them all at once? Why you should consider using an Asset Pipeline in your project?